Today’s post is going to be once again a bit more personal, however it is also going to be a sort of review. Today I am going to talk to you about my battling weight loss Journey and the difference Blogilates has made for me. For starters, if you are not familiar with Blogilates it started off as a wonderful lady named Cassey Ho posting inspiring exercise videos on YouTube in the form of Pilates but put to music and has now generated into one of the biggest online exercise support systems I have found, from weekly YouTube updates to a blogilates downloadable app. I found Blogilates in the Winter of 2012 and I haven’t looked back since. In 2012 I was a young 17 year old girl; innocent, naive and bullied. I had a crush (yes one of those stories) and he was a complete jerk, but for two whole years I doted on every word he said, every conversation we had I held deeply. I was stupid. He and his friends would tease me, under their breathe they would comment about my weight. One day they even said it to my face, that was the day I changed. I spent hours in my bedroom crying, I honestly hadn’t realised I was that big; but I was. I made a decision that day, I wanted to show them what I could really look like, how beautiful I could really be. Now, I know how foolish that really was, I never again want to change myself for any one person but myself. I was constantly seeking approval from friends, family, anyone who would congratulate me on my mile stones. I ate only salads, drank only water and exercised every night, I swam in an ice cold pool in the middle of winter, I did everything I could think of to lose weight. I had goals, I wanted to lose 20 kg, I did. Mid year 2012 I found Blogilates. I had a love hate relationship with the scales. To this day I won’t use scales, I will never use scales, I believe they are not correct and honestly they put me in terrible moods but that’s all for a different post. I am an extremely sensitive person and stepping on the scale was a horrifying feeling, seeing the scale numbers go down was amazing, I used to run out to my parents and excitedly tell them the news, but if the scale went up I was a ticking time bomb, it was only a matter of time before I exploded into a fit of emotions; anger, sadness, disappointment to name just a few. My poor parents took the brunt of it. My school formal came around and I fit into the size 12 dress I bought, it worked, all the hard work and tears paid off. That night was amazing, but it wasn’t what I wanted. I realised just how stupid I had been, how naive. 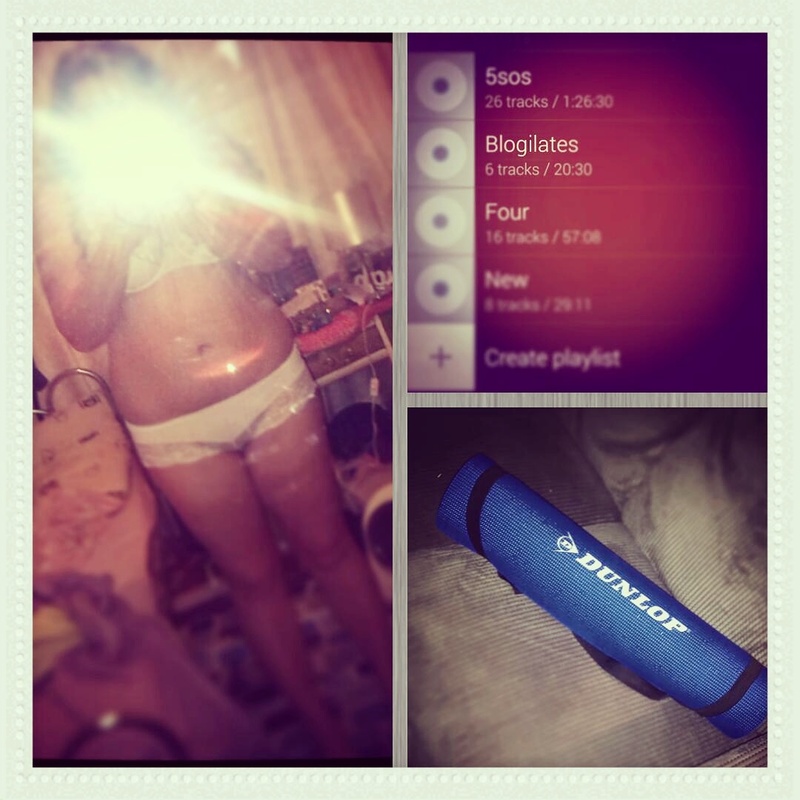 I vowed that I would no longer change myself to please anyone, however I did still continue on with Blogilates. I took a break for a few months, early 2013 I started again, this time with a different mindset. Blogilates helped me change, helped shape me into who I am, especially when it comes to my weight. At the moment I am going through a really difficult time accepting myself and loving my body. Days are difficult, looking in the mirror is hard, but the support and love through the blogilates community helps me. The videos put out by Cassey herself help me with my struggle. I absolutely adore the energy and personality Cassey puts into each and every one of her videos. She is such a vibrant and happy person, but even she would have her bad days. Bad days are excepted, they are okay! I wish I could personally thank Cassey for the inspiration she has given me to succeed when it comes to not only my weight goals but all my life goals, I can only hope that she may see this post and know just how much she has done for me, and possibly many more like me! The YouTube videos are for all exercises, from cardio to squats, obliques to arms, so varied you can barely find two the same. I have made myself a training schedule from bits and pieces from a varied range of videos and I can’t wait to start it and see results! I would highly recommend Blogilates to anyone and everyone, if your looking to lose weight or just stay in shape, the programs are for everyone. The community is amazing, and the mentor is inspiring! Thank you for reading! Please have a wonderful day and if anyone in this sort of situation or any for that matter need to talk, send me a message on my Instagram or Facebook! I want to help!